And this isn't the first time an animal was elected into office. This isn’t the first time I’ve written about animals becoming prominent members of the society, and it seems it won’t be the last. 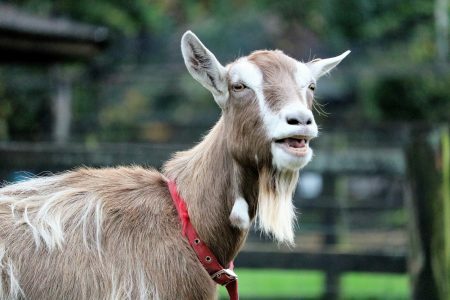 This time a goat named Lincoln was elected the mayor of a small Vermont town. At the young age of 3, Lincoln has become the first honorary pet mayor of the town of Fair Haven. The nanny goat was chosen this week by the townspeople for the one-year post at the community’s Town Meeting Day. Lincoln is scheduled to take office Tuesday. The ballot of 16 pets was open to all the town residents. Most of the other candidates were dogs and cats, but there was also a gerbil named Crystal. Lincoln won with 13 votes, just beating out a dog named Sammie who received 10 votes. The other candidates got the rest of the 30 votes. During his time as Mayor, Lincoln will be expected to attend events such as the Memorial Day parade, in which he will be wearing a custom-made sash. Fair Haven is a town of only about 2,500 people and (obviously,) does not have a human mayor. Joseph Gunter, the town’s manager, said he heard about a small town in northern Michigan that did something similar and he thought it would be good. He thought it would be a good way to raise money for a playground. It only raised about $100 as the entry fee was only $5.00. But it did provide other benefits. “It was a great way to introduce the elementary school kids to local government,” he said. The balloting for pet mayor was held along with the regular Town Meeting Day vote, but any town resident was invited to vote in the election. You never know, a new mayor may be coming to a small town near you! Make sure you get out there and vote because you never know what types of animals could be thrown onto the ballot.